Here we go again: I was all excited about donning my fall gear, but the weather is being weird. Luckily as a self-professed the master of transitional dressing, I’m all about wearing a piece of clothing different ways, and sometimes even in ways that’s not its intended use. When I got the denim shirt dress, I was expecting to wear it paired with tights, boots and maybe even a cute over-sized cropped sweater layered on top. I will eventually do this later, but it is not yet cold enough for that. So for now I’m wearing the shirt dress as a sort of light jacket, layered on top of crop tops and a breezy pleated skirt. In the event that the temperature dips enough for me to feel a bit chilly, I can always button up. 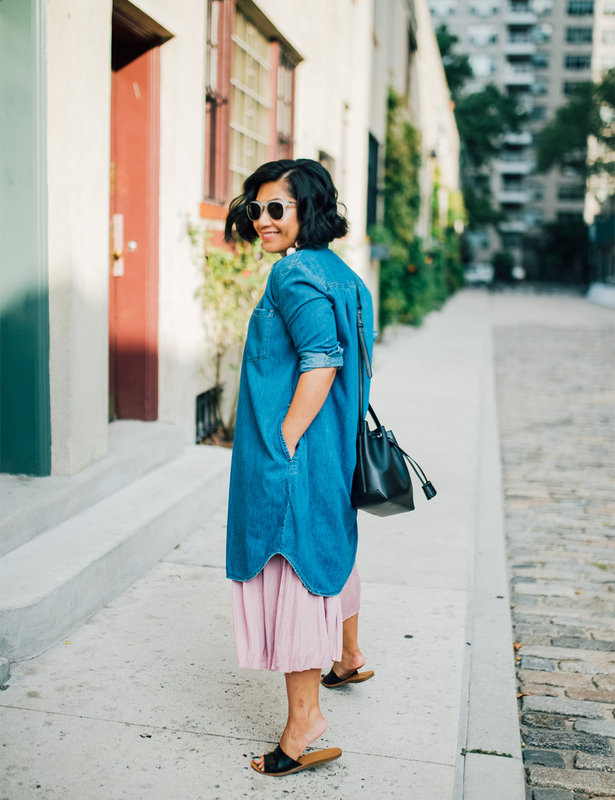 Gosh I just love the versatility of an over-sized shirt dress. 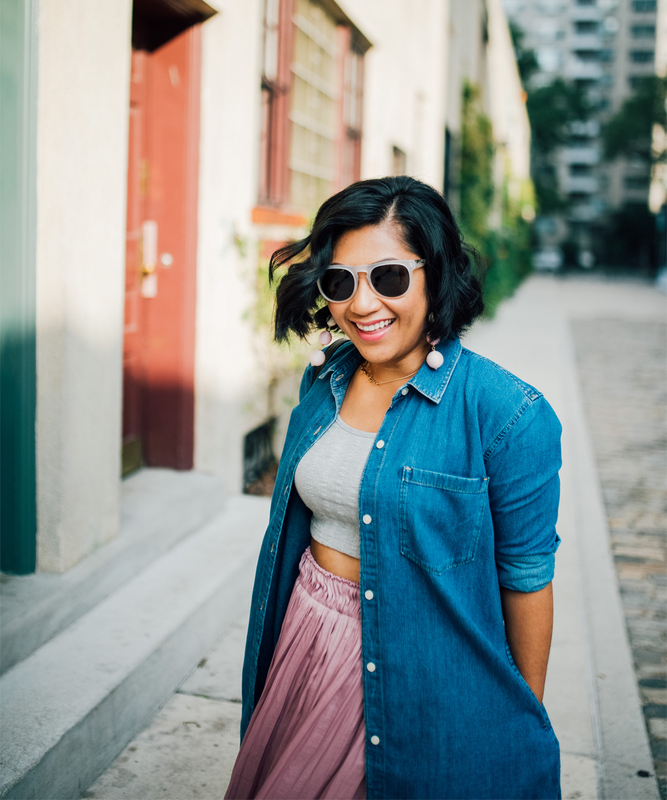 Read on to see more of this outfit and my top favorite over-sized shirt dress picks. Oh and spoiler alert: there’s also a Charming Charlie giveaway at the end of this blog! Outfit combo: denim girlfriend shirtdress from Gap, ribbed cropped vest top from Topshop, pleated mid skirt from Gap, sandals, faux-leather drawstring bag from Old Navy, faux-leather slide sandals for women from Old Navy, austin earrings from Charming Charlie. Now time for the best part of this blog post: the giveaway! 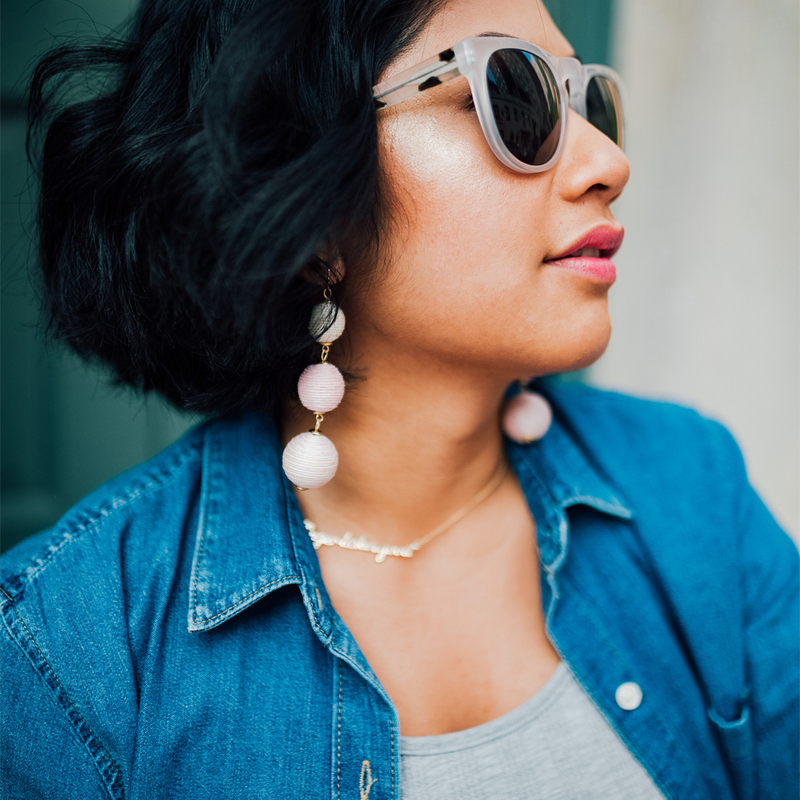 One lucky winner will get themselves a $50 gift card to buy whatever their heart pleases, including the super gorgeous Austin earrings that’s featured on this blog. Sweepstakes begins Friday, June 2, 2017, at 12:00 a.m. EST, and closes on Saturday, June 17, 2017, at 12:00 a.m. EST. I’m really into this look, girlfriend! 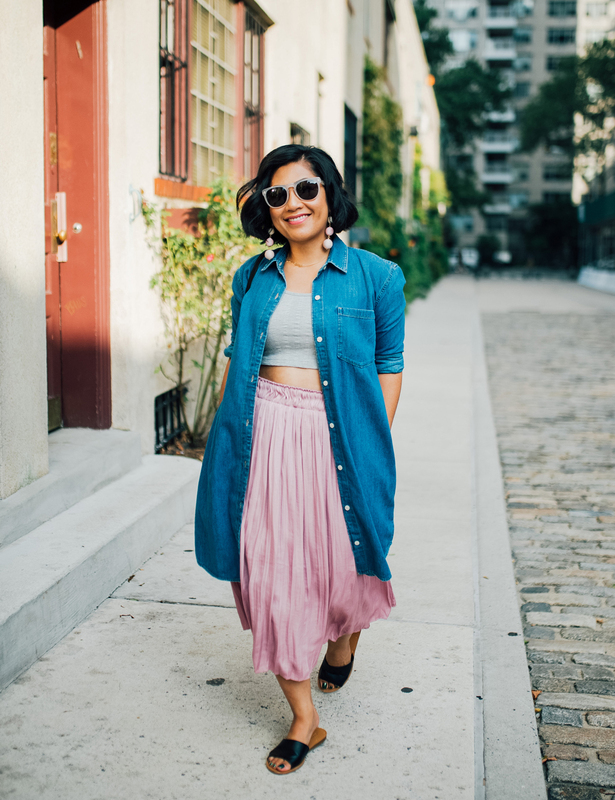 The oversized chambray button-up over your crop and skirt is such a genius layering technique! I’ll have to try it out sometime! I so love looking around Charming Charlie! I’d love to have the WINTER PLAID WEEKENDER TOTE!!! I like the Mari Saddle Handle Crossbody bag. I love this outfit!!! I’m a little self conscious with crop tops but pairing it with a skirt like this is SO cute! Charming Charlie has some great new fall arrivals. I love the ‘SEINE CHOKER COLLAR SWEATER’ and the ‘FRINGE TASSEL HOOP EARRINGS’ ! I like the rose glitter satin heels. Omg omg I love Charming Charlie! It is one of my favorite stores to shop at. I am in love with the CARRI RIBBED TOP. I would also get the BELLE & BUMBLE MERMAID & UNICORN TEE. Thanks so much for the chance to win a gift card for this store. It’s so much fun! I will probably buy some necklaces with the gift card. My kids yank on my necklaces or pull on them and I have hardly anything left to wear! What a fab idea! I love these layers. I seriously need to get some new fall accessories! 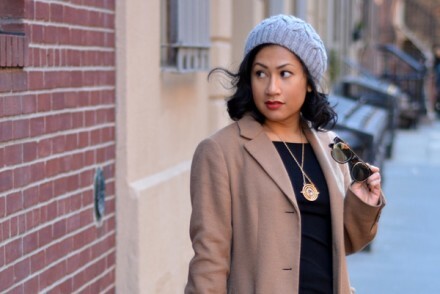 Definitely love how you layered this! The dress over the skirt is so chic! You look adorable! Love how you styled this! It has been a weird fall, hasn’t it! I really love this outfit! It’s so cute, and love how you styled it! Girl I am obsessed with this look! I LOVE how you styled that shirt dress. So gorgeous!! I love that pleated skirt! Absolutely love this look on you!! That skirt is gorg! I like the coffee a latte hoodie. I love this outfit babe! That skirt is so pretty! Love how you styled this denim dress!! This outfit is absolutely adorable. I would have never paired the skirt with that denim button up but it looked amazing!! I’d love to get the HARLYN STATEMENT NECKLACE SET. I would get the FIGARO LINK LAYERED NECKLACE and the WEEKENDER TOTE. I’d love to get the GIRL POWER top and ELLSEY CLUSTER DROP EARRINGS. I would get the MAJA BRAID KNIT CARDIGAN – super cute! I love this outfit babe! Your skirt is so gorgeous. I have never thought of this…but I love it! I am in love with the way you’ve layered this! It looks amazing. I would choose the Love Heathered Sleep Dress! I love the FILIGREE TEARDROP NECKLACE SET. They have cute handbags and so I would likely get one! I love the Corsa Floral Knit Dress! I would love to get the Maree T-Back Dress! I would use the gift card to buy a choker and earrings! I just got a new cartilage piercing in my ear. I would love to get a couple necklaces.